This month is all about the OpenChain Specification. We are approaching a new release and are seizing the opportunity for reaffirming the core text and goals of the project. At the same time we are seeing new interest and engagement from both technology stakeholders and those from further afield. Speaking of further afield, we just released some milestone curriculum material in Simplified Chinese under CC-0 licensing (effectively public domain). See below. The OpenChain Project has developed a specification that defines a core set of requirements that a quality FOSS compliance program is expected to satisfy. Although it represents a minimum set of “must have” requirements, a significant degree of flexibility is given on how an organization might implement them. OpenChain Conformance helps to reduce concerns about open source compliance in organizations of all types and sizes. We update the specification periodically based on feedback from our community. At the moment we are in the home stretch before releasing version 1.2 in April. This release does not change the requirements of the specification but introduces improvements to language and definitions to make OpenChain Conformance and translations easier. We are seeking public comments as we wrap things up. There are several large entities currently undergoing OpenChain Conformance. We are working closely with these new and old community partners to assist and to learn. 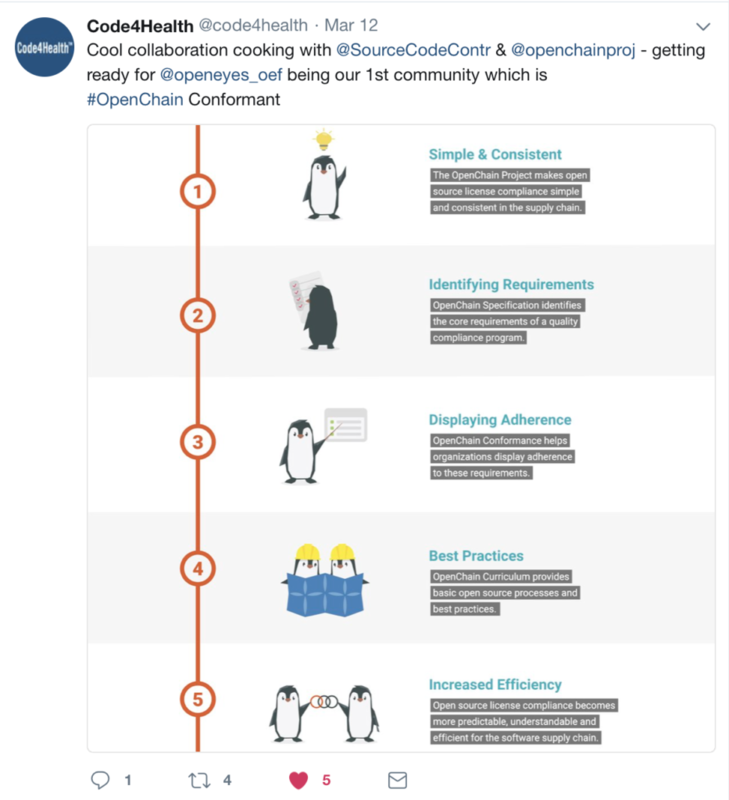 OpenChain Conformance is often a two-way process, involving listening to great feedback that helps us improve the OpenChain Specification or the OpenChain Conformance process itself. Most attendees had a direct interest in using some or all of the OpenChain curriculum to support their compliance efforts. All attendees expressed interest having open source compliance collaboration between companies to encourage deeper open source use in companies. Most attendees faced various challenges in explaining this to the administrative side of their businesses. One area of useful feedback was that some attendees asked for future events to be held in Hsichu or Neihu so that their colleagues can join. Some may be able to offer a meeting room at their offices. Our colleagues at the Open Culture Foundation are exploring the opportunities and may hold another workshop in April or May. OpenChain Project held a governing board meeting, a face-t0-face and a standing room-only talk at the Linux Foundation’s Open Source Leadership Summit in Sonoma. This event was a great chance to reconnect with many of our core constituents and to personally engage with some potential new contributors. For those of you who are new to the project, our governing board consists of representatives from our 14 Platinum Members, and it meets once every quarter to discuss strategy. Their input ties directly into the activities of our Specification, Conformance, Curriculum and Onboarding work teams, each of which was represented or discussed during our open session. The OpenChain talk was delivered by Shane Coughlan, OpenChain Project Director, to the general Leadership Summit audience. It was interesting to note the level of engagement and questions fielded by the audience. It highlights both the amount of interest there is around improving compliance and areas where we can usefully focus on developing new onboarding or reference material. In partnership with Moorcrofts in the UK the OpenChain Project announced details for an OpenChain session at a BCS event in London on the 22nd of March. Shane Coughlan, OpenChain Project Director, will deliver a keynote on OpenChain at Linaro Connect in Hong Kong on the 22nd March. The OpenChain Japan Work Group has announced that its third meeting will be held on the 19th of April at the Panasonic offices in Osaka. The OpenChain Project will be featured in talks and workshops at the Legal Network ‘Legal and Licensing Workshop’ held in Barcelona between the 18th and 20th of April. The OpenChain Curriculum slides are now available in Simplified Chinese. This is a significant milestone in sharing useful open source compliance information with a key target demographic. Great thanks are due to Hung Chang and Navia Shen for initiating the OpenChain Simplified Chinese translator team, to Lucien Lin for creating this translation, and to Florence Ko for review. The next month will be all about case studies, reference material and expanding the community of conformance. Not to mention the formal release of the OpenChain Specification 1.2. Stay tuned and feel free to join any of our work teams at any time. You insights always help make us better.